Hello Friends! Happy Post-Season Weekend! There have been some amazing football games this weekend, some amazing upsets (in my mind) and just all around good times. The Texans and Patriots are still battling it out as I type. As I posted last week, I created a meal plan and a workout plan to help keep me on track for the week. I did a pretty good job of following both of these plans – not perfect, but pretty good. The meal plan stayed mostly in tact with a few shifts. Wednesday and Monday meals were switched, Thursday night we ended up getting Thai for dinner and so Thursday’s dinner moved to Friday. Friday’s meal got nixed. 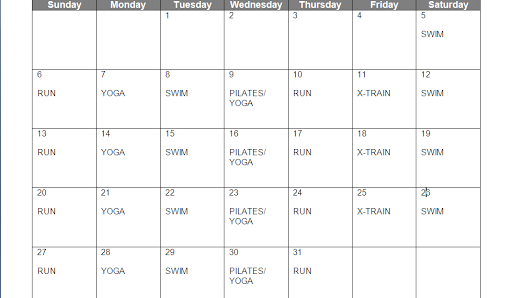 As for the workouts, I did a pretty good job, but had to take a little break the end of the week. Saturday: Swim – no, we ended up having other things fill up our day. 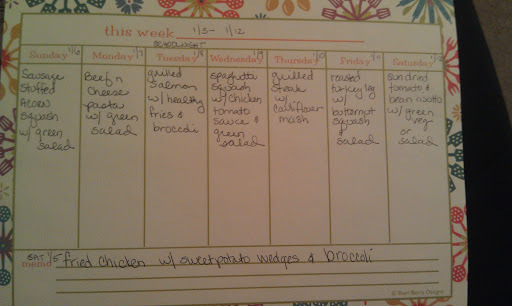 I did spend some more time meal planning for the week and have put the menu together for the week. Sunday: Actually, I don’t know. Chris wanted to grill something and bought a variety of stuff at the store, so I’m not sure what he is making. My scale has been all over the place this week, so I plan on staying off of it for a while so it doesn’t freak me out. I have a post coming up this week about portion sizes so keep an eye out for that! I also have a couple other posts in the percolator that should show up on the blog this week as well. This entry was posted on January 13, 2013 by Corrie Beebe in exercise, food, meal plan.